Uriel the Inheritance is book 5 of 6 in the Airel Saga. New York Times and USA Today Bestselling thriller writer Aaron Patterson teams up with Chris White, in this exciting new young adult paranormal romance series! Fans of Veronica Roth, Suzanne Collins, Cassandra Clare, and James Dashner will love this young adult fantasy series by Aaron Patterson and Chris White. "Move over Twilight! Here comes Aaron Patterson!" 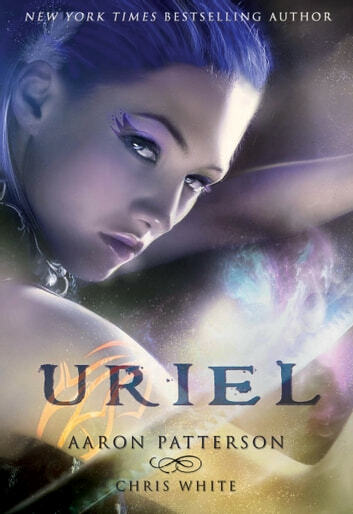 Uriel is a young adult paranormal story about an angel who is running from her past and becomes entangled with the Brotherhood. She gives birth to a son in Arabia, 1250BC. He is the key to the survival of his kind but soon finds that sometimes good and evil are the same thing. In present day, Boise, Idaho Airel is back home after losing her best friend. Things are supposed to go back to normal but nothing is going according to plan. Michael and Airel's love is tested once again and must prove to be real and unbreakable, or destroy them both. With only one more book (Uriel: The Price) in the Airel Saga, this is the beginning of the epic conclusion to a series that I have enjoyed writing and I hope you have fallen in love with Airel and her world as much as I have. "It takes rare talent for a man to write a novel from a male POV and have it published to great critical and commercial acclaim. But it takes a miracle for that same male, or in this case males, to write a novel from the POV of a teenage girl and have it turn out as incredibly as did the new StoneHouse YA by Aaron Patterson and Chris White, AIREL. From the first sentence, I felt compelled to dive into this young woman's story and just as importantly, I felt like I personally knew her, which means I laughed, stressed and cried right along with her. A beautifully written and crafted fiction about teenage innocence, faith, loss and love. A must read for teens and adults alike." "I am happy to say that this novel is one of my favorites of its kind. I never thought I could read a novel like this and be so swept away! I am always willing to try new books, but I usually steer clear of this kind of novel. Not anymore! Not when I can be so engrossed into the character's story, like I was with the beautiful AIREL, that before I know, it's over. I kept turning the pages , wanting to, no-NEEDING, to know what was going to happen next." Uriel: The Inheritance is for readers who enjoy teen & young adult historical fiction medieval, teen & young adult romance, paranormal & fantasy, paranormal romance, teen & young adult religion & spirituality, christian fantasy, christian fiction, teen & young adult love & romance, christian literature & fiction, angels, demons, immortals, fallen angels, small towns, good vs evil. Aaron Patterson is a New York Times and USA Today bestselling author of the thrilling hard-boiled Mark Appleton series, (1)SWEET DREAMS, (2)DREAM ON and (3)IN YOUR DREAMS and also the Sarah Steele Series, BREAKING STEELE, TWISTING STEELE and MELTING STEELE.